It’s a photograph embedded in both memory and history. A child flees toward the camera, her arms poised aloft as if to carry her into flight. Her mouth gapes open in a scream. Flames have peeled the clothing from her scorched body, and her left arm features a ghostly pale sleeve of burned flesh. Other children, alternately agonized and stunned, encircle her in retreat, while soldiers amble at their flank with disinterest. Behind them all, smoke looms like a black leviathan, swallowing the sky. Tyndale Momentum (2017). 336 pp. $16.99. These were the final shouts 9-year-old Kim Phuc heard before her world dissolved into flames—before napalm bombs fell from the sky, burning away her clothing and searing deep into her skin. Against all odds, Kim lived—but her journey toward healing was only beginning. How could she possibly survive the pain of her devastated soul? From the moment of its publication in 1972, the “Napalm Girl” picture—originally titled “The Terror of War”—shocked the world. The iconic image captured all that is tragic, perverse, and horrifying in warfare, and its appearance in major newspapers fueled controversy about U.S. involvement in the Vietnam War. So influential was this one picture, that photographer Nick Ut earned the Pulitzer Prize. Kim Phuc’s famous photograph, taken when she was 9 years old, offers only a glimpse into the anguish she suffered in the wake of the bombings. Napalm decimated her childhood home and killed her cousin. It scorched the skin from her back, shoulders, and arm at a temperature of 2,000 degrees Fahrenheit. As she fled down a puddled road screaming, “Too hot!” a well-meaning passerby doused her with water, which only reignited the napalm clinging to her. She awoke in a morgue, left for dead, with maggots worming through her wounds. Phuc’s parents rescued her from that morgue, but not from further torment. Daily therapeutic baths in the hospital inflicted such excruciating pain that Phuc would pass out in the burbling water. She eventually returned to the charred remains of her village, but as a disabled child, whom neighbors ostracized for her disfigurement. As she grew, she longed to study medicine, but that dream, too, withered when the Vietnamese government discovered her value as a propaganda tool. It was only the peace that Jesus offers that could settle the flames inside of me. As officials dragged her from university classes to participate in press conferences, her last lingering hopes faded, and she sank into despondency. “The searing fire that penetrated my body,” Phuc writes, “the ensuing burn baths; the dry and itchy skin; the inability to sweat, which turned my flesh into an oven in Vietnam’s sweltering heat. The lack of pain pills, the lack of ice, the lack of acceptance, the lack of love, the killing of my hope—what could hurt worse than these hurts?” (86). Initially, Phuc begged for help from the gods of CaoDai, the syncretic religion her family devotedly followed. But silence ensued, and her hopelessness deepened to suicidality. “After years of unanswered prayers, it was clear to me that either [the gods] were nonexistent or they did not care to lend a hand” (97). With no hope in sight, Phuc forged a plan to hurl herself into oncoming traffic, to finally end her tortured life. Too emotionally crippled to endure another press conference, and with the threat of suicide still bearing down on her, one day Phuc hid from government officials amid the stacks of a university library. As she crouched from view, she found a copy of the New Testament. The grace she encountered in its pages, and Christ’s radical claims, stole her breath. “Despite all that I had learned through CaoDai—that there were many gods, that there were many paths to holiness, that so much of my ‘success’ in religion rested atop my own weary, slumped shoulders—Jesus presented himself as the way, the truth, and the life” (98). Those bombs led me to Christ. From that moment hiding among books, Phuc embarked on a journey toward Christ. The suffering continued, and in fact worsened as her faith estranged her from her family. She faced political oppression, loneliness, poverty, and crushing physical pain. She struggled to forgive her enemies. Yet gradually, she saw how God had been pursuing her while her wounds contorted into aching scars. He had been chasing her along that dirt road, with the smoke billowing at her back. He was with her in the morgue, in the baths as the water lapped her tender scars. “There was a story beneath the story,” she recalls. “A divine underpinning that for many decades even I could not detect, a set of spiritual stepping stones that, unbeknownst to me, were paving a path to get me to God” (vii). 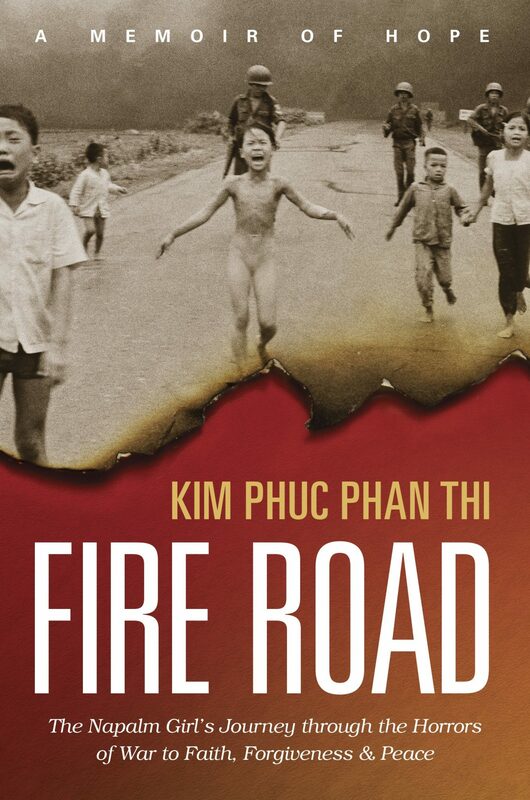 In Fire Road, Phuc lays those stones at our feet, and invites us to walk with her. She carries us through pain that hollowed out her soul, to the one who sought to fill it—the one who had also borne scars. “As to the greater meaning behind my pain, for so long I had been in the dark,” she writes. “And yet here were so many people telling me that my picture had prompted them to pray. . . . Those bombs led me to Christ” (257). Phuc weaves her narrative with grace and tenderness, and with an optimism that she musters not from promise of worldly gain, but only from abiding in Christ. Years ago, UNESCO recruited her as an ambassador for peace, and she now travels the world as a motivational speaker and an advocate for children of war. But she has no illusions about the source of her peace. “The education, the money, the food, the family, the healing, the freedom, the reunion with my ma—all of the things I craved along the way were never going to satisfy my soul,” she writes. “It was only the peace that Jesus offers that could settle the flames inside of me” (290). In sharing her saga, Kim Phuc also carries us down that fiery road, beyond the agony trapped in pictures, to the God who is there, the God who draws near to the brokenhearted and saves the crushed in spirit (Ps. 34:18).